Turns out it is not as bad as it looks. It seems that years ago they placed wood over the old vinyl rather than removing it. This kept the sub-floor from rotting out. Some new ply-wood and it's as good as "new". 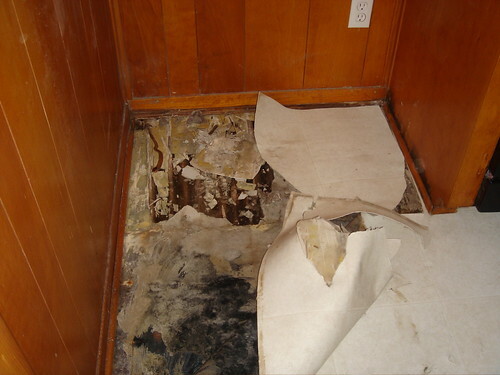 So the rot was only one layer deep rather than into the flooring. Good news. You need some. Don't know the story about what happened, but it looks like it wasn't a fun day. It turns out that our refrigerator had been slowly leaking for a long time, and initially they thought that the water had rotted out the entire sub floor. We were expecting a major repair – but it turns out that a lazy guy 40 years ago saved us a ton of cash today... Thank goodness for human nature.